Mercury rising into the 120-degree range wasn't enough to stop the KGP photographers from grabbing a series of up-close photos of the Lincoln MKT doing a bit of extreme weather testing under tire-melting conditions. As reported, the MKT will be getting EcoBoosted with a 3.5-liter V6 good for 340 horsepower and 340 lb-ft of torque. As you'll notice from the photos, the MKT has the glass roof and huge rump from the concept car. More details in the spy report below. 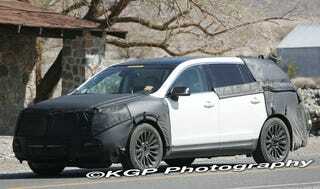 Lincoln MKT Spy Report Lincoln's Ford Flex-based MKT crossover made an appearance in Death Valley to do some hot-weather mountain runs in the 120-degree heat. Our desert sighting gave us a chance to get a closer look at the MKT, and this production model's faithful transition from the MKT concept which appeared at the last Detroit Auto Show. Ford made the MKT's future official with an announcement at the recent Pebble Beach Concours dElegance, confirming that the Lincoln would be built alongside the Ford Flex at Ford's Oakville, Ontario assembly plant. A 3.7-liter, V-6 engine will power the standard MKT, while the MKS' EcoBoost turbocharged 3.5-liter V-6 will be optional, putting 340 hp and 340 lb-ft of torque at the ready. A six-speed automatic transmission be used in all MKTs. A glass roof was visible on this prototype, to add to the MKT's upmarket cachet.